I am often asked how I survived the roller-coaster ride of the entrepreneurial lifestyle for nearly five decades of marriage. Usually this question is posed by a young couple who is just starting out on a journey that frightens them. I can see the terror in the eyes of the spouse of said entrepreneur-wanna-be. I always respond with the question, “What’s the worst that can happen?” to which the reply invariably relates to losing their “stuff”. Their home, their savings, their cars, their status. I know their response before it is uttered. Let me tell you without hesitation, that those fears of loss are NOT the worst that can happen. Far from it. If you are able-bodied and able to flip hamburgers or mow a lawn, you are capable of putting food on the table. If you are thinking “entrepreneur” it is highly likely you can bring in an income in some form or fashion even if your dream business doesn’t work out. Trust me on this. I know from personal experience of having lost all the above. And I lived to tell the story! No doubt you have heard it and if you haven’t you can get the sordid facts in my Creating a Haven of Peace book. That story is not the essence of this blog post. What I want to point out is the worst thing that can happen is loss of family. Loss of relationship. Loss of spouse. The Miller family takes relationship very seriously. When we lost our house and cars and “stuff” we worked intentionally daily to maintain the Haven of Peace we so desired in our home. We worked to keep the lines of communication and support firm and strong during some very dark days. And our family has thrived in spite of those circumstances. And that’s the point. No matter what your circumstances, hold onto one another. No matter the differences, just practice being kind rather than right! Studies at Johns Hopkins report that positive social support (family and friends) plays an important role in one’s ability to make healthier choices. Their research goes even deeper to claim that in terms of chronic disease, blood pressure and heart issues, having the support of family can make a huge difference and even determine life or death. Strong statements. 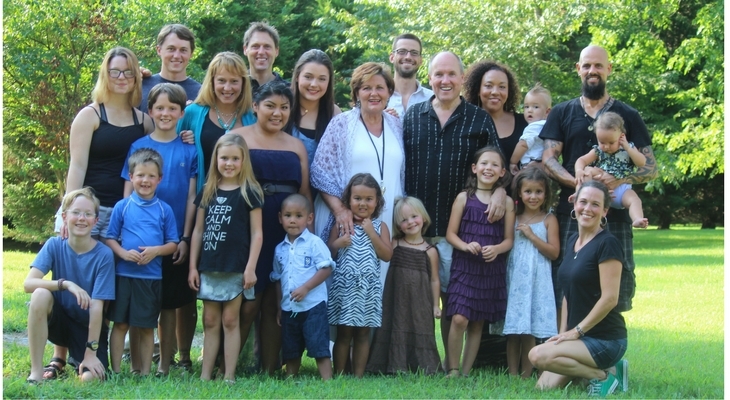 The photo above is of our family, biological and grafted in. One young man, Francois, who lives in Rwanda but was grafted into the family over a decade ago was the only family member missing from this photo taken less than two weeks ago. When our “big financial crisis” left us with hundreds of thousands of dollars in debt and the loss of our “stuff”, the five of us (Dan and me and our three children) clung together in love. And look what that love and devotion to one another has produced! I couldn’t be more excited about the lives of these young people and their own entrepreneurial journeys. They have all experienced the ups and downs and unexpected turns of life. But each and every one of them know the importance of family and sticking together…in spite of circumstances. I’m feeling very blessed. This is the message of my heart. It is the message of peace, love and family I want to impart to the world. Especially in these uncertain times of political and international chaos. Barbara Bush said it very eloquently in an interview with the Washington Post in 1990: “Your success as a family…our success as a society…depends not on what happens in the White House, but on what happens in your house.” I pray your house is the Haven of Peace you desire most. I’ve seen so much of the world. From the desperate and inhuman to the profoundly beautiful and awe inspiring. Through it all, relationships have always trumped everything else. They’ve always been the only thing that really mattered to me. And now, as a father and husband, I want to create a home, a haven of peace for our family. As a child, I have no memories of being poor or lacking in any way. I only have memories of love and interconnectedness. And that is because you and dad deliberately committed yourselves to fostering that experience. Thank you, thank you, thank you for that commitment. It’s effect will ripple throughout the universe forever. That is the type of meaningful legacy we should all strive for. Much love!